I hope looking at this website will inspire you to look at Daylilies as a much valued and appreciated garden perennial for you all. I have been gardening with my husband on the outskirts of the beautiful New Forest and growing, (and trialling the newer), daylilies for 18 years now and at the last count I had just over 1500 different cultivars in the garden and display areas. So yes, I am just a bit fanatical and the display areas are necessarily huge to house so many daylilies but even the smallest garden could be enhanced by the many different choices of varieties available. It is now possible to find in this country almost every colour you would wish for in a garden plant from very cool near whites and lemons to ultra bright oranges and reds and my preference the blue blacks and lavenders. They can also be very short and small blooms, ideal for cultivation in tubs or rockeries to very tall and striking. My own personal preference is for the plants which form my National Collection which was granted in 2004 of Spider and Unusual Daylilies. These are tall, spidery as opposed to round, and very exotic. Magnificent. One of the reasons for applying for the National Collection was to promote awareness of my favourite form of daylily and we now open the display area as a living catalogue during bloom time so that I can do my favourite thing and show my daylilies off and maybe even tempt you to purchase something for your garden. So, if you get tired of the beach and you need to recharge your batteries after long walks in the beautiful New Forest why not come and see us. As well as the National Collection we have lots of the beautiful ruffled round ones too if that is more your preference. We are always grateful if, when you visit, you could put a donation in the Oakhaven Hospice tin but there is no set entry charge. The absolute optimum bloom period when most of them will be flowering simultaneously is the four weeks from 26th June onwards. The mail order catalogue this year has around 400 daylilies included and can be download as a pdf by CLICKING HERE. You will also find here our daylily special offer and order form. This has proved very popular in the past especially for beginners who as yet have not become "hemeroholics" as a cheaper way to get started. In 2004 Pollies Daylilies appeared on the Gardeners World television programme, with a follow up rerun in 2006. Filming this was a wonderful experience. Chris Beardshaw and the crew came down for the day and filming took the whole day, between showers. The daylilies, (unlike yours truly), stood up to the very heavy rain well and Chris is so very charismatic and really put a very nervous me at my ease. Most of the take was done at a time when I didn't realise the cameras were running so I don't think it turned out too badly! In 2007 I was very honoured to supply the daylily named Grace and Favour which was used as the masthead of the 2008 Chelsea Flower Show. More exciting was that the plant had been hybridised by a then British based breeder now moved to the sunnier climes of France. It shows that UK breeders are trying and succeeding in getting themselves on the map. Terry and I are now hybridising on a moderate scale and enjoying some success. I hope from the pictures (CLICK HERE) that you agree. Any seedlings which do not reach Terry's extremely high standards but are too good to go on the compost heap are on sale here for £3 each. This is a great opportunity for you to buy one and name it yourself. Good fun! 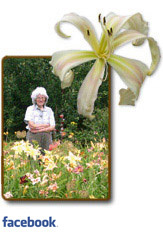 I undertook my first talk on daylilies to the general public on 7th July 2010 to the Dorset Hardy Plant Society. I was so flattered that, having listened to me chattering on when they visited, they then came back and asked me to do this. Daylilies are very versatile plants which respond well to a little care and love, warm sunshine, (I wish), i.e. not much shade and a little moisture at bloom time, ( no problem there, then) and reasonably good soil. Daylilies come in all shapes, colours and sizes and are reasonably problem free. The slugs and snails rather like them when they first emerge so a bit of vigilance is required then. I am often asked about this so I will mention that the early flowering varieties only can be effected by a gall midge which may necessitate the removal of the first early buds but is easily controlled by doing this and trials are now taking place at Wisley to look at ways of dealing with this problem. But I am stressing again that daylilies are pretty much problem free and although each bloom only flowers for a day once the plants have established in your garden you can have as many as 200 blooms on each plant over a long period. I am always surprised, when seeing how exotic dayliles are, just how attractive they are to native beneficial insects. They certainly attract hover flies in their hundreds, (eating the pollen much to Terry's disgust as this seriously curtails his breeding attempts), and also many, many ladybirds. Wonderful!